Home › Real Estate › Rich Uncles Review 2019 – Invest In Commercial Real Estate For $500! Investing in real estate used to be a pain. You’d have to scout for properties, find tenants, oversee remodels, and manage ongoing maintenance. For most people who wanted to get a foot on the property ladder, the barrier was too high. Whatever about being able to afford residential property, commercial property was simply too expensive for all but the very wealthy. Then along came regulatory changes a few years ago, and all of a sudden it became affordable and accessible to earn income from commercial real estate investments without needing to be an accredited investor. In this Rich Uncles review, you will discover how it is possible to receive a steady monthly income by claiming your share of rental income paid by big name corporations, like Chevron and Chase Bank. Why Choose The Rich Uncles REIT? What Are Rich Uncles Returns? Is Rich Uncles A Good Investment? What Are Rich Uncles Approved States? Bonus 2: How Do REITs Work? Rich Uncles offers investors the ability to invest in real estate investment trusts (REITs) for as little as $5 at a time. There are good reasons to invest in this company, whether you are investing $5 or $50,000. Here’s why we think Rich Uncles may be a good investment vehicle for you. Want to invest without dealing with the stock market? Then Rich Uncles may be for you. Instead of investing your cash into volatile stocks, Rich Uncles invests in REITs, which are more stable and yield more consistent returns. One of the reasons the REITs Rich Uncles invests in are so stable is because the company invests conservatively, requiring tenants on its properties to sign triple net leases (NNNs). Triple net leases require the tenant to pay property taxes and pay for repairs and maintenance as well as paying rent every month. Because Rich Uncles doesn’t pay these expenses, the company have a larger profit margin, which may be a boon for your investment returns. Rich Uncles invests in student housing REITs. The demand for student housing historically has been steady, and that in turn translates into a steady, stable cash flow in these properties as tenants pay rent every month in order to live there and new tenants move in as old ones move out. Real estate can be lucrative, but investing in properties yourself can be risky if you don’t know what you’re doing. If you invest with Rich Uncles, the risks are significantly diminished because you can gain exposure to the real estate business without buying properties yourself. For all the reasons listed above, dividends from Rich Uncles are projected to be stable. While profits are never guaranteed, the odds are high that your investments will yield dividends month after month. Rich Uncles returns are intrinsically linked to real estate returns, and the property sector has generated market-beating returns during the first couple of decades of this century. The attraction to the real estate sector is obvious. Rich Uncles cites this chart from NCREIF.org which demonstrates that between 2000-2016, real estate growth of 144% outshone the returns of the S&P 500 which were 55%. Stock market investors may dispute the claim that real estate returns beat stock market returns. If you were to compare the asset classes over a longer time period, stock market total returns are higher. But the claim doesn’t take away from the major aim of Rich Uncles and the best real estate crowdfunding sites, which is to make real estate accessible to almost anyone. When you invest in the Rich Uncles NNN Reit or Student Housing REIT, you receive income in the form of monthly dividend payments. Rich Uncles dividend income is by no means a fast track to immediate riches. If you are a buyer of Bitcoin in the hopes of a moonshot, don’t expect similar rewards or risks here. The use of debt is highly conservative, which means the business is inherently protected from risks of rising interest rates or other risk factors. In fact, Rich Uncles only uses 50% debt compared to 80% – 90% loan-to-values by some others. As a result, you can be more confident that your Rich Uncles dividend payments will be stable over time. The flipside of lower leverage is lower returns but that don’t equate safety with mediocre returns. In fact, over a 5 year period, Rich Uncles estimates that your money will grow by about 50% based on a 7% annual dividend reinvested and 2% appreciation in property values. 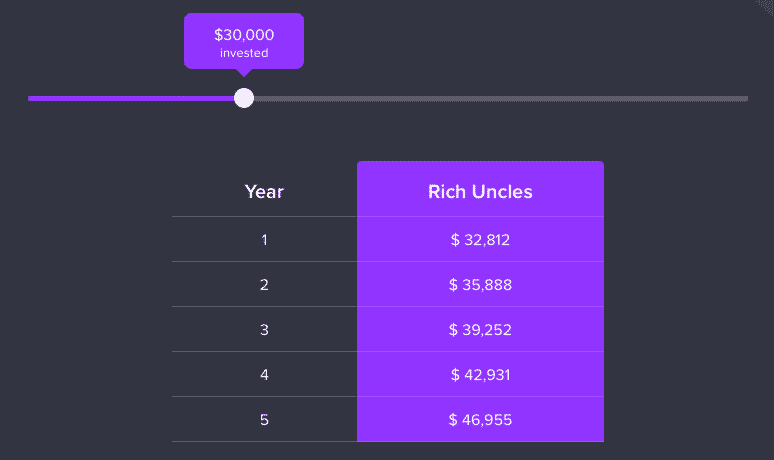 If you were to invest $10,000, Rich Uncles calculates that you could earn as much as $15,652 over a 5 year period based on a 7% annual dividend reinvested and 2% annual property price increases. With an average investor committing approximately $30,000, the projected payoff is $46,955 over a 5 year period. Sign up, choose how you want to get paid, provide your social security number, and in the time it takes to boil a cup of tea, you could be invested in commercial real estate! Getting started with Rich Uncles is lightning fast. Simply, sign up beside the Rich Uncles login with your email address and create a password. Select the amount you wish to invest in an individual, joint, retirement or trust account. Choose whether you wish to receive your dividends in cash deposited to your bank or reinvested monthly. Provide your social security number or business EIN, review the legal terms, connect your bank account and sign documents online. 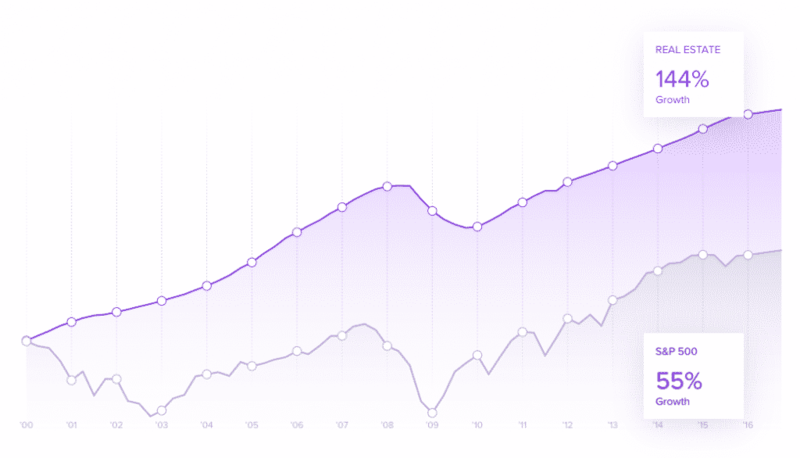 From start to finish, we found the process easy to follow, intuitive, and fast with no hiccups along the way, from connecting a bank account to providing authorization and executing documents. Based on the Rich Uncles prospectus, a snapshot of the properties in the Rich Uncles I portfolio is featured below and shows heavy exposure geographically to California and to the retail sector. According to its prospectus, Rich Uncles had spent approximately $181,000,000 acquiring properties as of March 31, 2018. Commercial property tenants are subject to triple-net lease terms that transfers the obligation of taxes, maintenance, and insurance to the tenants. The advantage of commercial properties is that brand name tenants, such as Chase Bank, FujiFilm, Wyndham, Harley Davidson and Williams Sonoma, are clients and they are less likely to default on rental payments than would be the case for a residential tenant. Rich Uncles focuses on a wide range of commercial properties, including retail, office, and even gas stations. Another attractive feature of Rich Uncles REITs is nationwide locations that provide geographic diversification. Plus, they act as an inflation hedge and offer an investment opportunity that is uncorrelated with the stock market. Rich Uncles is a REIT so you don’t own property per se but rather shares in an entity that owns the property. No 1031 exchanges are permitted. 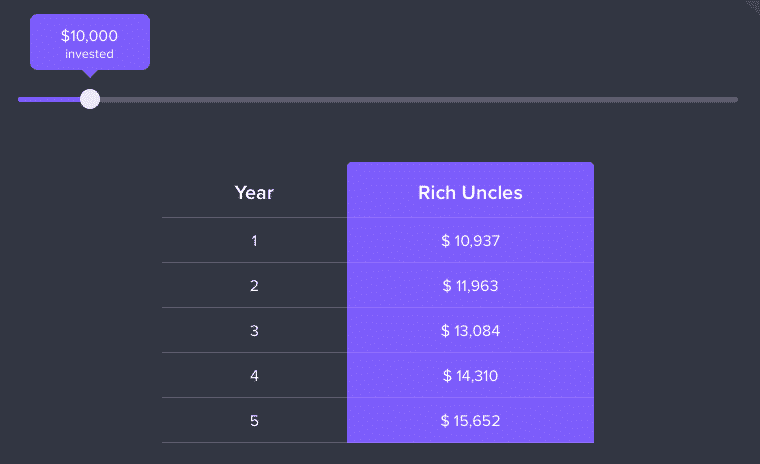 Rich Uncles has a low minimum to get started and pays monthly dividends which is attractive for investors seeking regular cash flow but fee transparency could be improved. ✅ Low Investment Minimum: You can get started for just $500. ❌ Illiquid Investments: Rich Uncles will repurchase shares monthly but also states that “you must be prepared to hold your shares for an indefinite length of time” which suggests liquidity is limited. ✅ Monthly Dividends: Dividends are paid each month from rental income and may be received in the form of cash deposits or reinvested. ❌ Geographic Exposure: While Rich Uncles has broad (though not full) nationwide coverage, heavy exposure to the retail sector is noteworthy in some investment offerings, such as Rich Uncles I. ✅ Non-Accredited Investors Permitted: You don’t need to have the income and net worth requirements of an accredited investor to gain exposure to commercial real estate. ❌ Rich Uncles SEC Investigation: From our research the company was scrutinized for its radio ads. If so, it’s not much cause for concern because the company suspended them. ✅ Comparatively Low Debt Exposure: Rich Uncles limits LTVs to 50% in order to lower the leverage associated with any purchase. ✅ Nationwide Coverage: To maximize portfolio diversification, Rich Uncles features properties mostly nationwide. ✅ Non-U.S. Residents: U.S. residents as well as foreign investors are eligible to invest with Rich Uncles. ✅ Hands-off Investing: Unlike some online real estate portals, such as Roofstock, which requires you to buy a property and has associated responsibilities, Rich Uncles will source, own, manage, and operate properties. ✅ Triple-Net Lease Terms: Rich Uncles operates triple-net lease terms with tenants so they are responsible for tax payments, insurance, and maintenance. ✅ Highly Rated Tenants: Rich Uncles leases to well-respected tenants, including major corporations and respected brand name firms. ✅ Zero Standard REIT Fees: Typical REIT fees are eliminated with Rich Uncles for lower overall expense ratios because Rich Uncles relies on technology and online marketing to lower traditional capital acquisition costs. ✅ A+ Rating: Better Business Bureau awards Rich Uncles an A+ rating. Only two types of fees generally affect investors, Share Repurchase Fees and Organization & Operational Expenses. If an investment goes really bad, a liquidation fee may apply. The longer you hold your shares the better off you will be. If you buy shares of a Rich Uncles REIT and sell those shares back within three years of initial purchase, you will be subject to a 1-3% fee depending on the duration of your holding. If you hold your shares for less than a year, you will incur the maximum repurchase fee of 3%. Holding shares for more than one year but less than two will result in a repurchase fee equal to 2%. And holding for more than two years but less than three years will result in a 1% repurchase fee. When you buy shares, 97% of your money is used to buy real estate while the remaining 3% is used to pay Rich Uncles, LLC for managing the REITs. Although 3% is taken out immediately, you still receive dividends on 100% of your invested amount. Given that the most recent Rich Uncles launch has been a $1 billion offering, the likelihood of a liquidation fee being applied is low. Nevertheless, it is technically possible that a liquidation event could occur from the sale of properties, a public listing, or a merger with another company. In such a scenario, investors may be subject to a 30% fee on the increase in share value at that time. Some other fees are charged by the advisor, Rich Uncles LLC, to the REITs (e.g. Rich Uncles NNN REIT) but none are passed on to investors, and Rich Uncles LLC has waived them since inception. Rich Uncles earns high marks for making it easy for any investor worth $250,000+ or earning at least $75,000 a year to gain exposure to a geographically diversified portfolio of commercial real estate. For just $500, you can get started and earn passive income monthly with the added attraction that Rich Uncles commits to delivering 7% in annual dividends to investors. Whether an individual, married, or looking to invest as part of an entity or trust, Rich Uncles caters to all and promises to save you 10% by cutting out middlemen, such as broker dealers who would otherwise earn commissions that hurt your returns. However, Rich Uncles loses a few points when it comes to transparency, both with respect to fees and vetting of properties. Although the company is SEC registered, no third party oversight is in place that we could determine to spotlight total fees because it is not a publicly traded REIT, so it is best to consult a financial advisor to ascertain the suitability for your own circumstances. Imagine a property costs $1,000,000 and you used $100,000 of your own cash to buy it and borrowed $900,000 from the bank. If the property value declined by just 10% from $1,000,000 to $900,000, your entire cash investment, the equity, would be wiped out. In essence, you would have lost 100% of the money you invested. On the flipside, if the property value rose just 10%, you would end up almost doubling your money after factoring in interest costs because the property would appreciate to $1,100,000 and you could pay back the bank $900,000 plus interest and keep the rest – almost $200,000 – for yourself. REITs are investment vehicles that pool investors’ capital with a view to gaining exposure to a broader real estate basket than would be possible if investors purchased separately. REITs are commonly used to purchase commercial and large residential properties, including office, industrial, and retail spaces. When you invest with Rich Uncles, you are buying shares in a private equity REIT (as opposed to a publicly traded REIT). ‹ Chris Tucker Net Worth, Is It Negative?